Are you tired of the messes and spills on your floor when your messy dog drinking from bowls? Do you want a simple, yet effective way to keep your floor clean? If yes, dog feeding mat is your answer. It will capture spills and messes, allowing your dog to enjoy food easily and safely anywhere in the house. A must have for dog owners. Keep your floor clean with the Snug Pet Feeding Mat for Dog and Cat. This mat features raised lip to catch food and water spills. The surface of the mat features a bumpy texture to prevent food bowls from sliding, slipping, and spilling over. The lip edge also helps prevent food bowls being pushed off the mat. Dishwasher safe and easy to clean by hand. Simply rinse in the sink with warm soapy water and wipe with a cloth. Are you looking for a way to effectively stop spills and splashes? If yes, look no further. 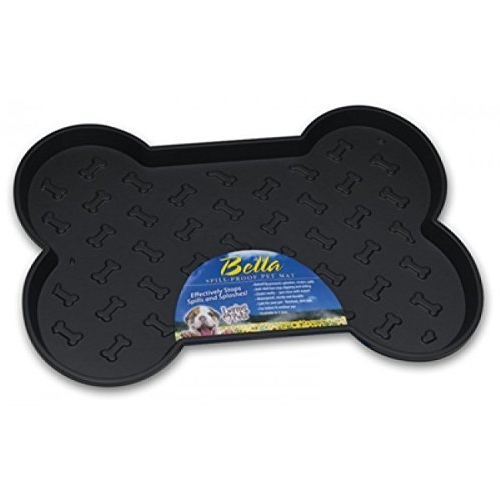 The Loving Pets Bella Spill-Proof Pet Mat features raised lip to prevent splashes and retain spills. It holds two bowls with bases up to 6-inches wide. The skid feet stop slipping and sliding. Waterproof; sturdy and durable. Non-toxic and BPA free, safe for your pets. Perfect for both indoor and outdoor use. Measures 18 1/4 inches by 13 1/4 inches. 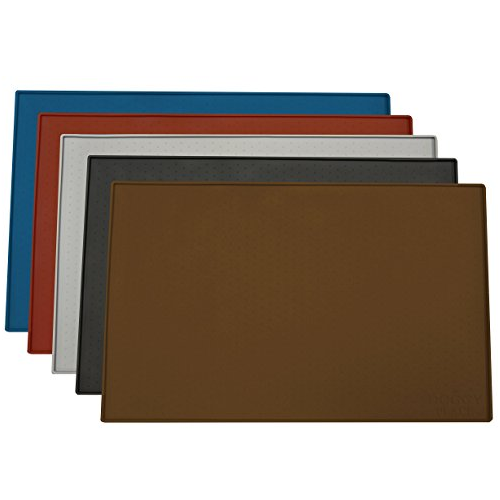 Give your pet their own dining area to minimize mess with the DII Bone Dry Pet Mat. Made of Microfiber, this mat is super absorbent and will immediately absorbs any slop, splash or spill. 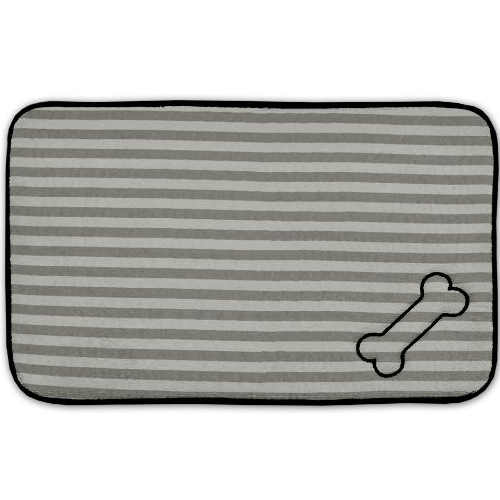 This quick dry microfiber pet mat is also fun and fashionable enough to fit most décor. A great way to protect your carpets and hardwoods from water spills or food stains. Also makes a great piece for your pets kennel or cage. 4. iPrimio ® Large Dog Feeding Mat with Paw Logo. Premium FDA Silicone (Gray – 22″ X 14″) Perfect Size. Hygienic and Safe for Allergic Dogs. Dishwasher Safe. Aniti Spill Edge. No Slip. Made of premium non-toxic, non-allergenic silicone in a stylish design, the iPrimio ® Large Dog Feeding Mat is great for any dog owner. 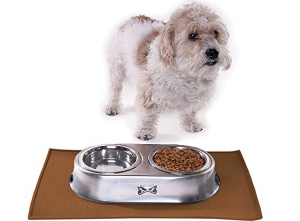 This dog feeding mat captures food and water spills from your pet’s bowls. It features raised outer lip to prevent food and water from spilling onto floor. Easy to clean under the sink or simply clean it in the dishwasher. 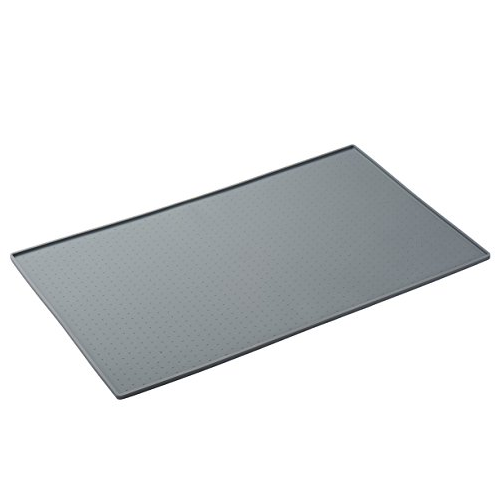 High quality and durable, the mat will stand up well to repeated use. No more messes in the house. 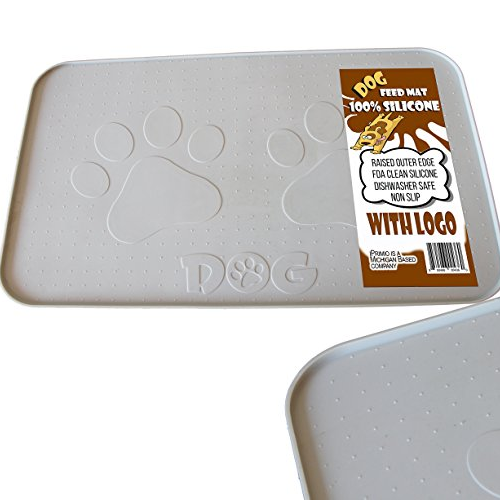 The My Doggy Place Dog Cat Food Feeding Mat has raised outer lip to prevent food and water from spilling onto the floor. Its anti-slip bumpers prevent you pet’s bowl from sliding. Clean up is a breeze. Just clean under sink, wipe with wet towel, or put in the dishwasher. Easy to store by simply rolling up the flexible, yet durable mat. Durable and convenient. Perfect for traveling.